1. An army needs water- these three kings badly miscalculated how much water they’d need. Or maybe the army became bigger than they estimated. For whatever reason, it was a big mistake. Without Elisha’s intervention, it would have been a total defeat. It’s the same for us. We are not civilians, we are an army. A soldier for Jesus. We march under the flag of the lion of the tribe of Judah. We march under his flag. We fight in a desert. India is a spiritual desert. It is dry of spiritual truth. Only 2.11% of the population is Christian. So, 1.2 billion are not Christian in the nation. This nation needs life-giving water. But interestingly, a vast majority do believe in a God. So there is a thirst for truth, but it’s a dry place. As a church, to march in this desert, we need water. Without the power of the spirit, the church remains defeated and weak. God is calling to build a strong church in the power of the spirit. The church marches on the spirit. It’s got the life of God in her. 2. God provides the water: v. 16-17 Here God came to the rescue of his people. Elisha speaks about a storm, before which there is a wind and rain. Says they will not see that. The sky is going to remain clear. When the rain comes, it cannot be contained. It comes down like a tidal wave. But Elisha prophesied the exact moment when the water came. But God is able to send life giving water to the most barren places. The water quenched the thirst of God’s people. The people must have been in joy and delight. It brings life. Also, it made their enemies flee. They saw the water and thought it was blood. Thought that they turned on themselves and broke cover. This is true in our own lives. When the Holy Spirit touches people, they find new life, a dream and destiny, new visions. In 2015, we had a very interesting time in encountering God at Jubilee Church, Worthing. The thick presence of God did not make us fall over, we went down. Everyone had amazing encounters with God that it was transformational. When you meet the holiness of God, it will change you. I once had an encounter when Jesus walked into the room with all his majesty. It was remarkable, I couldn’t move. The people who had encountered him, stayed changed. We can’t live in that moment of encounter forever, our bodies can’t handle it. But we remain changed forever. Water needs to flow to stay fresh. In the story, the water came in the direction of Edom and the country was filled with water. In India, Pandita Ramabai’s story and mukti mission in Assam. When god comes in this holiness, Christians weep and confess their sins. The presence of God undoes you. At this time, Christianity increased by 70% in our country. 3. Worship in prophetic- Elisha was angry at the king of Israel. At that moment it’s always easy to prophesy wrongly. Worship was his pathway to hearing the voice of God. One of the things we rediscovered was the role of worship in welcoming the presence of God. There is a link between worship and prophesy. It’s the environment we create to focus on heaven. In my own personal ministry, God restored my love for worship. Heaven is noisy. Day and night they never ceased to say holy holy holy… there is this choir. Then the 24 elders cast their crowns. There is this noise. It is a place of continual worship. As we worship we’re just joining in with heaven. It’s a live feed from heaven. As we worship, it’s like breaking an alabaster jar of perfume at Jesus’ feet. It fills the room and blesses everyone. We linger in the presence of God and wait for the spirit to move. As we do that, he moves more and more remarkably. The river beds are dry and waiting for water to flow. 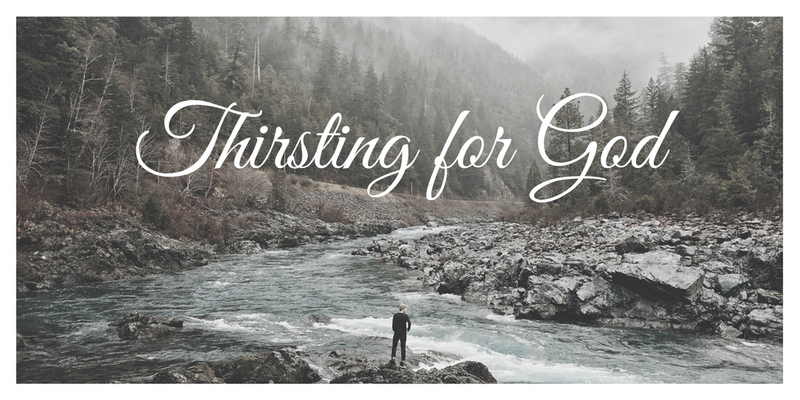 In every Christian, there is a riverbed waiting to receive the spirit. God never designed these river beds to be dry. There are trees growing on the banks. How dry is your riverbed today. Are your channels blocked? If the riverbed is full of rubbish, when the flood comes, it creates chaos. Are there things clogging up the flow of the spirit? The key is this- make Jesus lord of every part of your life. It’s a lifestyle that reflects that. The conviction of sin in the time of revival is too terrible for words. We don’t often see the conviction of sin in our lives. When the spirit of God pours out, it floods everywhere. Let’s pray if your riverbed is dry, ask for God to fill it. This morning we will start in the beginning, in Genesis 1. That is the story of creation. Creation answers a lot of Big and deep questions, like who am I, where did I come from, what’s the purpose of all this? But fundamentally, we learn about our God- who he is and what he does. It is easy to miss. We are going to slow jam the creation the story. What it’s going to tell you is that our God is great and good. Great as in awesome, magnificent, mighty! 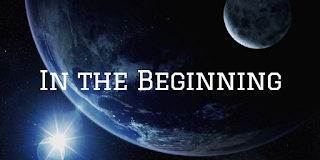 In the beginning, God created the heavens and earth. 1. The scope of his creation is great. If you were walking around 6000 years ago, what scope means is, if he looked around on the earth, it is all created by God- the mountains, rivers, seas, animals, plants, everything. The scope of his creation reveals his greatness. That same scope remains true for us today. There are places on the planet that haven’t even been discovered to explore. We are finding new species of animals and plants today. It’s true of the heavens. We are discovering more and more planets, and other stuff we never knew about. 2. The nature of his creation- he said, let there be and there was. He made everything out of nothing. I will need things from you in order to make something from you. We need raw materials to make anything. But God says, and it’s done. 3. The method of creation- One story of the ancient Babylonians of creation is that of a war that some god had to strive and vanquish a foe to create. But our God doesn’t strive. He suffers for his creation later, but he doesn’t suffer in creating. It doesn’t just happen, but it is good. The result of God’s creation is something good and wholesome. God in the first 3 days creates and next three days, fills and makes beautiful. He creates, the sun and moon, seasons, seas and skies, and fills them with animals and plants. Finally, even the land he fills with vegetation and animals and finally us. When we are doing things, we are to do them as excellent stewards. He gives the whole earth to man to steward. It’s a pretty big task. We also see God’s goodness in this passage. It’s noteworthy that before God creates mankind, he’s already fulfilled all of his needs. Before they even know what their needs are, they have already been fulfilled by a God who loves them. This is true of us too. 2 Tim 1: 8-9- “So do not be ashamed of the testimony about our Lord or of me his prisoner. Rather, join with me in suffering for the gospel, by the power of God. He has saved us and called us to a holy life—not because of anything we have done but because of his own purpose and grace. This grace was given us in Christ Jesus before the beginning of time,” Do you treasure the fact that our king has come to become a man, suffered for us, saved us? When did this happen? Before the creation of the world, he knew his son would die for it. That is the goodness of our Lord. For continuing to do what God has called you to do, you need faith and strategy. God spoke to Joshua and promised to give him the place where he put his feet. But he did not sit idle. He sent spies out to check out what Jericho looks like. Prayer is also very important in being strategic in what God has called us to do. Can I encourage you to make the prayer-time before the meeting very important? You will be amazed at how God speaks! People will get healed. Prayer is the engine room of the church. It’s a new year, 2017- we have all made some plans to do this or that. Some of us have big plans. Where do these plans feature in Gods big plan and picture? Paul was concerned with God’s big picture and proclaiming it. In Acts 20:27 he makes it clear saying “For I have not hesitated to proclaim to you the whole will of God”. He believed that is people understood this people will understand Gods plan for the world. In chapter 20, when Paul was entering Ephesus, he asks if they received the Holy Spirit. They received the Holy Spirit, prophesied, spoke in tongues, etc. He spoke about God being in the midst of his people. Paul was with them for three years. That big picture changed the course of the life of Timothy, Titus etc. Paul was travelling to Jerusalem. He calls the elders of the church of Ephesus. He is reviewing what he had done with them. He said he did not hesitate to preach the while counsel of the Word of God. Life is not about our little world. It's about the big picture. We often think of God only on relation to our needs, our forgiveness etc. It's not like that. There is a vast plan and God chooses you. It’s not about becoming more religious or self improvement. We are not called to live a life of defeatism. It's about Gods eternal glory. In the trials God is working out a plan. 1. 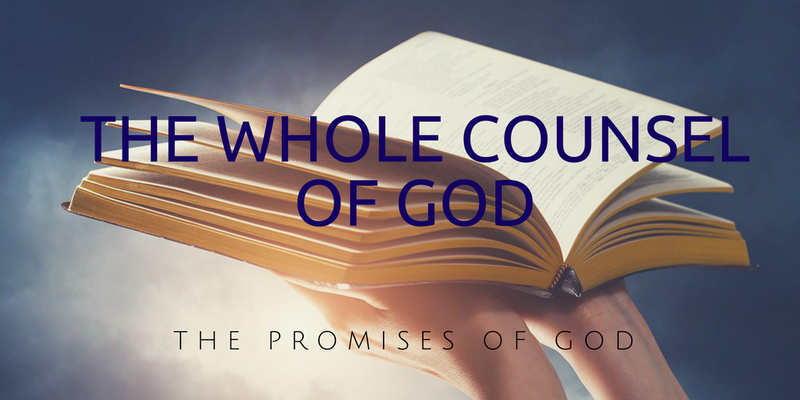 All God’s promises are fulfilled in Jesus: When Jesus comes back he will judge sin and evil and he will bring righteousness and peace. 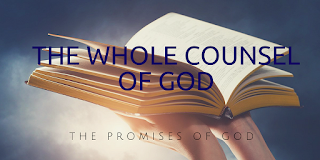 What does it mean to understand the whole counsel of God? The promise on Adam the seed will defeat Satan. In Abram the nations will be blessed. In David he will always have someone on throne. All these promises are fulfilled in Jesus. These promises don't stop there. We are new creations and we inherit these promises. 2. The Promise of the Temple: We need to understand that there is a promise of a temple. It's a place where God dwells with his people and to receive their worship. PJ Smyth explains this. From space where he hovered over the whole earth, to the garden.... and finally to us- God met with man in Jesus. Now he lives in us. What a privilege! We did not ask for this. God chose to do it for us. This is reason enough to worship. He lives in is individually and in us as a Church. 3. The promise of the kingdom: Jesus said that the kingdom of God is near. In the garden of Eden, the man and woman were given authority to rule over the earth. After the fall, Satan was called the king of the air. When Jesus healed and drove out demons it meant that the kingdom of God was there. That is not the end of the narrative but just tasters that are revealed to us. 4. The Promise of Salvation: the story of how God will save and redeem his people. there is a need of sacrifice to atone for sin. All the nations were going to be blessed due to Abraham’s sacrifice. In Isaiah 53:10- “Yet it was the Lord’s will to crush him and cause him to suffer, and though the Lord makes his life an offering for sin, he will see his offspring and prolong his days, and the will of the Lord will prosper in his hand.” Victory was anticipated through this. He will see his offspring. That’s the victory we see in Jesus. The very next chapter in Isaiah invites the nation to come into the good of the everlasting covenant. Jesus served his proud and ambitious disciples right before becoming the lamb of God. he finished for what he has come, he conquered death and rose again. There is now no condemnation for those who are in Christ. We can now approach him in the confidence in the blood of Christ, the name of Jesus. We cannot do this on our own. We need the spirit of God to understand the big picture and figure out our part in it. We are called to be the vehicles for his kingdom. We are called to be heralds of Jesus Christ. And to do that we need the Holy Spirit. How many of us made New Year’s resolution. We all feel at the end of the year the slate, has been wiped clean, and we have a fresh start. Some New Years’ resolutions go like this: Read more, exercise more, learn something every day, find a new hobby etc etc. Some goals are big and some small. We all have different kinds of goals. We all have goals. I want to put a goal that is life defining for you at Word of Grace Church . This is a biblical goal. God has a plan for your life- to make you more like Jesus. That we will be conformed to the image of his son. Can that be our goal for this year? 1Pet 2:21 To this you were called, because Christ suffered for you, leaving you an example, that you should follow in his steps. We do this through the Word. What does the Bible say? Read, understand and obey. We need the Holy Spirit for this. We can also have living example in our lives and we can imitate them in how they follow Christ. The gospels contain the life of Jesus and we shall look at it. God plan in choosing us is to make us like Jesus. It is not automatic but systematic. Read though the gospel of Matthew and write down everything Jesus did. Jesus is just beginning his ministry. At the beginning of his ministry he got baptized. John was unique. He wore Camel's hair. Ate locust and wild honey. Somehow people from all over came to him. His message was of repentance from sins. Baptism was a sign they were sinners. Can you imagine John's shock when Jesus came to him? However, Jesus lived the life as a model for us to follow. These are Jesus last words. This is after his death. He has all authority in heaven and earth. So this command affects everyone. So not only did Jesus do it but he also commanded us to do it. Thirdly, we see this worked in the Bible. What did the disciples understand? Acts 16:13-15 Paul understood Jesus command. They did what Jesus asked them to do. On the Sabbath we went outside the city gate to the river, where we expected to find a place of prayer. We sat down and began to speak to the women who had gathered there. 14 One of those listening was a woman from the city of Thyatira named Lydia, a dealer in purple cloth. She was a worshiper of God. The Lord opened her heart to respond to Paul’s message. 15 When she and the members of her household were baptized, she invited us to her home. Phillip talks and explains the gospel. V36. So this command is twofold. We get baptized and we help others to get baptized like Philip and Paul did. What did Jesus do next. Matt 3:6 He was filled with the Holy Spirit. Luke 4:1 Jesus, full of the Holy Spirit, left the Jordan and was led by the Spirit into the wilderness. So we see Jesus example. Acts 1:4 “Do not leave Jerusalem, but wait for the gift my Father promised, which you have heard me speak about. Acts 1:8 what does the Holy Spirit do? You become bold, powerful and be able to be my witnesses. They got baptized in the Holy Spirit and they spoke in tongues. Acts 10:44-47 While Peter was still speaking these words, the Holy Spirit came on all who heard the message. 45 The circumcised believers who had come with Peter were astonished that the gift of the Holy Spirit had been poured out even on Gentiles. 46 For they heard them speaking in tongues[a] and praising God. Our new year’s resolution at Word of Grace Church is to become more like Jesus. We see His life , the commands and what the disciples and the early church did. What do we need to do? If we are Christ followers, we should do the same. Acts 16:29-33.The obedience was quick. At that hour of the night the jailer took them and washed their wounds; then immediately he, and all his household were baptized. 34 The jailer brought them into his house and set a meal before them; he was filled with joy because he had come to believe in God—he and his whole household. Acts 9: 17 -18 Paul, got baptized immediately. If we have been baptized , it is our responsibility to make disciples and be filled with the Holy Spirit, and be continually filled with the Holy Spirit. Are we seeing the gifts and fruit of the Spirit in our lives?